Material Cultures: Now sold H 200.7cm W 141cm D 37cm * A combination of deep shelving, with a storage cabinet and small desk/bureau. 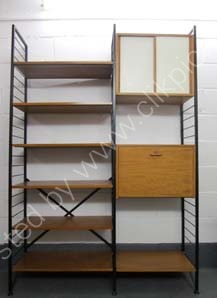 Available with white or black ladders, blue, red or teak sliding doors. Shorter ladders are often available on request.